One of the most famous dishes from Mexico, the pozole. The word pozole comes from the Nahuatl pozolli which means frothy. Place the corn in a large pot, cover with water, add 1 head of garlic and salt to taste and fire medium for half an hour. After that time, adds meat to the pot and cooking for 1 hour or until meat is well soft. He dismisses the head of garlic. Boil tomatoes until it has softened. Soak the chiles in hot water until they are soft, remove the seeds and the tail and grind them along with the tomatoes, salt, oregano, cumin and 1 clove garlic. Strain. When the meat is soft, remove from pot and shred it. 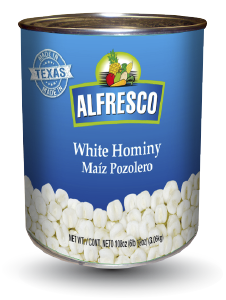 Pour red sauce into pot with hominy and let it release the boil. Return the shredded meat to the pot, it rectifies the seasoning and let it boil a few minutes before serving. Served with lettuce, onion and a few drops of lemon juice. Serve with toasts. Tip: you can replace pork with chicken. He served in earthenware bowls for a better presentation.